Resistance is futile....I will get you (and you will love me for it)! Here is the thing. I really am not some crazy lady going around badgering all moms out there who I think are not doing things 'right'. What I am is an experienced babywearing mama and a certified babywearing educator. I have spent the last 4 years carrying my children around in baby carriers on my tummy, my hip and my back and the last year educating myself and gaining even more experience as a formal babywearing educator. I understand the mechanics of babywearing, the benefits of babywearing and the joys of babywearing. When I stop a mama or a daddy to discuss their babywearing, I am not doing it to be a nosy ninny or a crunchy mama know-it-all. I am doing it because, even if they don't know it, what I am about to tell them WILL help them do it better! My advice will likely make their use of the baby carrier more comfortable for them and for the baby. The information I share is meant to inform. Decisions to do or not do what I say are completely up to the parents. And that is my goal. To help parents make better decisions about what baby carrier to get, what babywearing can really mean to their parenting and how to do it so that all parties involved are getting the full benefits of this amazing practice. Today, I worked a wonderful trade show and co-ran the show's "Stroller Check". The concept being that you come to the show, check 'in' your stroller, check 'out' a baby carrier and do some hands-free, paraphernalia-free shopping. What I learned, yet again, is that there are many misconceptions, much misinformation and so many mamas who need to know more about using baby carriers and jumping on this amazing babywearing bandwagon! "There is no way my toddler is going to like that!" (this from the Mama who's little one immediately fell asleep and had a good 45 min nap in the Pipa Pack while her Mama finished off her shopping)! And then there was the whole slew of new mamas who were given a carrier or bought a baby carrier or sling, but had no idea how to use it. And so I wrapped, and tied and buckled all these mamas into different Stretchy, Woven and Gauze Wrap Carriers, Mei Tai's or Soft-Structured Baby Carriers. And the results where pretty close to unanimous. Almost all of those babies came back sound asleep or just waking up from a lovely nap. And almost all of the mamas came back with this look of wonder on their faces, like they never knew life could be SOOOOO good. And that MAKES MY DAY and my job so worthwhile! Yes, yes, I know, I run a retail business. I am in the business of selling a product and making a profit. But the true joy in what I do is knowing that the products I sell and the services I provide actually have an impact on someones life. What I do changes peoples lives for the better, even if it is just a little bit. ....and I get to hold babies all day long. And trust me, THAT, never gets old!! 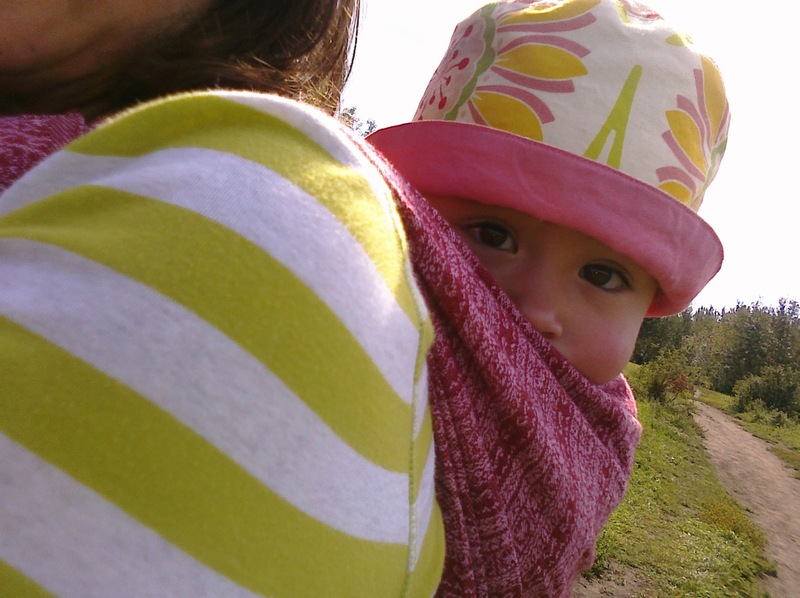 *For more info on WHY I chased the mama, please read THIS comprehensive article about babywearing and the reasons behind why forward facing out is not a recommended position for wearing your baby. **and P.S. The Mama was leery of me at first, but listened to what I had to say and we eventually found a proper position that worked for both her and her baby!